Any brownie that is described as chewy and fudgy is an automatic winner in my book, and these are no exception. Made not only with cocoa powder, but also unsweetened and bittersweet chocolate, the brownies are rich in flavor and perfectly paired with a glass of cold milk or a scoop of velvety smooth vanilla ice cream. 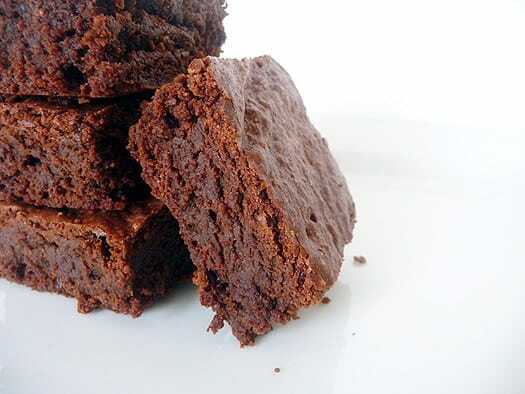 Brownies that have that coveted fudge-like texture are often thin as cakier brownies tend to rise up a bit more, but these are an outstanding combination of both – they retain that chewy and fudgy texture while baking up into thick and substantial brownies that have a definite heft when you pick them up. A chocolate and brownie lover’s dream! 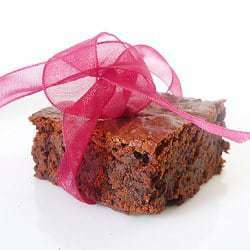 I have made quite a few brownies in the last few years and have posted many of them here on Brown Eyed Baker. The first was the recipe from Hershey’s, which is still my go-to recipe when I want a quick batch of brownies since they are super quick to throw together and bake. My all-time favorites are the French Chocolate Brownies courtesy of Dorie Greenspan. They are not a a typical one-bowl quick brownie, but they are so unbelievably worth every minute of your time. 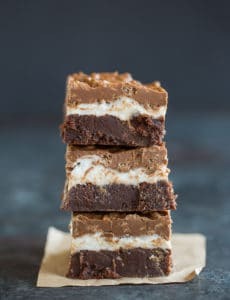 I have also tackled Ina Garten’s famed Outrageous Brownies, which are indeed fabulous, but come in just under Dorie’s in my list of favorites. Also from Dorie were the Quintuple Chocolate Brownies and Chipster-Topped Brownies, and then I came up with the Cookies and Cream Cheesecake Brownies. Next on my list is the Baked Brownie. Have any of you tried it? I don’t have the book yet but am planning on picking it up soon. 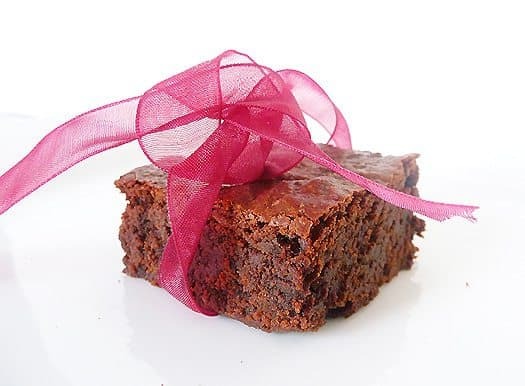 I’d also like to try a no-frills “classic” brownie recipe – perhaps either Dorie Greenspan’s or one from King Arthur Flour. Who am I kidding? I’ll probably make both! 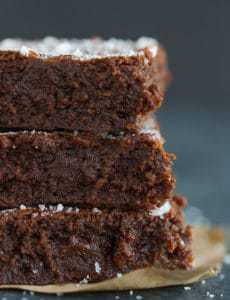 These chocolate brownies are to die for! 1. Adjust an oven rack to the lower-middle position and heat the oven to 350 degrees. Spray an 8-inch square baking pan with nonstick cooking spray. Fold two 16-inch pieces of foil or parchment paper lengthwise to measure 8 inches wide. Fit 1 sheet in the bottom of the greased pan, pushing it into the corners and up the sides of the pan (overhang will help in removal of baked brownies). Fit the second sheet in the pan in the same manner, perpendicular to the first sheet. Spray the sheets with nonstick cooking spray. 2. In a medium heatproof bowl set over a pan of almost-simmering water, melt the chocolates and butter, stirring occasionally until smooth. Whisk in the cocoa until smooth. Set aside to cool. 3. Whisk together the eggs, sugar, vanilla, and salt in a medium bowl until combined, about 15 seconds. Whisk the warm chocolate mixture into the egg mixture; then stir in the flour with a wooden spoon until just combined. Pour the mixture into the prepared pan, spread into the corners, and level the surface with a rubber spatula. Bake until slightly puffed and a toothpick inserted in the center comes out with a small amount of sticky crumbs clinging to it, 35 to 40 minutes. Cool on a wire rack to room temperature, about 2 hours. 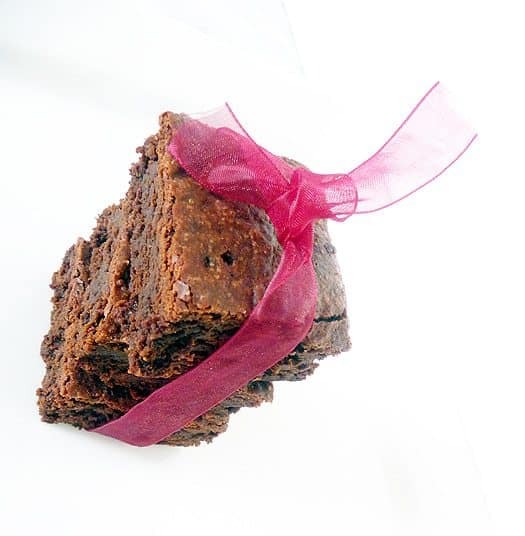 Remove the brownies from the pan using the foil or parchment handles and transfer to a cutting board. Cut into squares. You really should credit Cook’s Illustrated as this is their recipe. I have it in a copy of their book Baking Illustrated. You really should read to the bottom of the recipe before leaving a comment like this, so as not to appear as an idiot. I am so sad to say that I was disappointed with this recipe… way to much of a bitter chocolate “sting.”:( Nobody in my household would eat them. I guess I am still on the hunt for a good brownies recipe. Sorry for the negative comment. I made these brownies last night. I didn’t have unsweetened chocolate, so I substituted with cocoa powder and butter (read about the substitution on the Internet). I topped the brownies with chocolate chips. 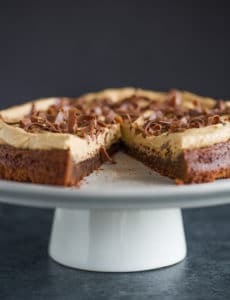 This is one of the best brownies recipes I have tried! So fudgy!! Thanks for sharing! !